Here are photos from a November 12, 2018 walk across Vesper Meadow. The meadow is a well-known camas gathering area for local Indians and is located on the Dead Indian Plateau in the Cascade Mountains of southern Oregon. 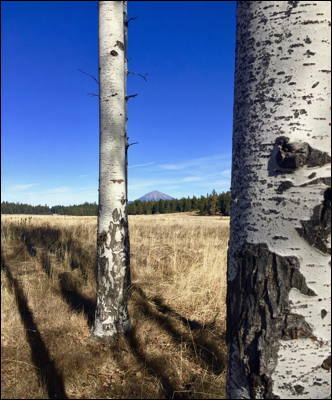 Photos show Mount McLoughlin in the distance, the discovery of a truffle along Dead Indian Creek, the frozen creek, and bear claw marks and elk chews on aspen trees.